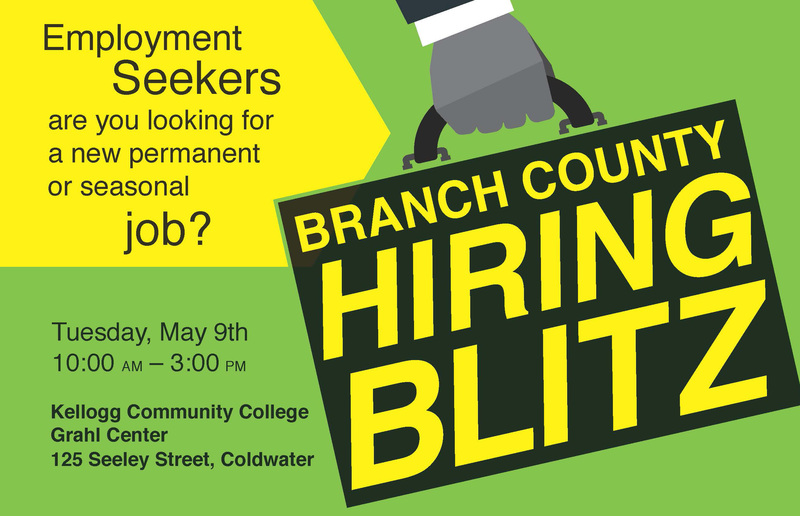 More than 30 companies will be looking to hire permanent full-time workers or workers for seasonal employment positions at the Branch County Hiring Blitz May 9 in Coldwater. Individuals looking for work are invited to come to the job fair event prepared to interview any time between 10 a.m. and 3 p.m. Tuesday, May 9, at Kellogg Community College’s Grahl Center, 125 Seeley St., Coldwater. All candidates should dress professionally and bring plenty of resumes to distribute to employers. Need help with your resume or learning how to conduct a fair-based interview? Participate in Blitz Prep between 8 a.m. and 5 p.m. Monday, May 8, at the Michigan Works! Service Center, 210 Vista Drive, Coldwater. Contact Michigan Works! at 517-278-0200 for details. Walk-ins are welcome! For more information about the Branch County Hiring Blitz or to register for the event in advance, visit http://branchcounty.chamberofcommerce.me/Calendar/moreinfo.php?eventid=248248. Advance registration is not required.